Most people are pretty familiar with the octopus. Their eight legs and a propensity for squirting ink to evade predators have made it a pretty well-known ocean species (ask any kindergartner what “O” stands for and they’ll likely either tell you ostrich or octopus). And while multiple sets of legs and a built-in escape system is pretty badass on its own, the octopus has several other, lesser known tricks up its sleeve. This skeletonless mollusc may look soft, but it happens to be one of the most extreme creatures in the sea. Scientists still have no idea how they do it, and it remains one of nature’s unsolved mysteries. 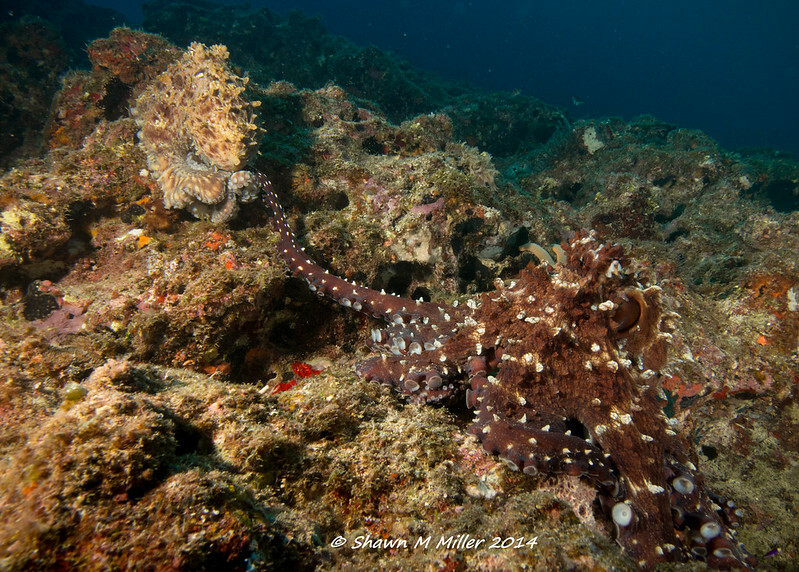 The octopus can change it’s color, shape and even it’s texture to blend in with its surroundings. Their specialized skin cells are made up of reflective iridophores and leucophores which simulate a wide range of colors, while their unique musculature is responsible for transforming their overall shape. Some species of octopus can take on the shape of seaweed as well as other species such as lionfish, sea snakes and eels. Here’s the unexplainable part: while the octopus has keen eyesight, they can’t see color, so it is still undetermined how they are able to mimic such exact colors. Most men would agree they’d do just about anything to win the object of their desire. But what about tearing their own arms off? When it comes to reproduction, the octopus wins for extreme measures. The octopus’ legs have a variety of sophisticated biological functions embedded, one of which is fertilization. A specialized arm is responsible for the transfer of sperm; however, like with most species, sometimes the female isn’t as receptive to certain male propositions. When this occurs in certain species of male octopus, he will sometimes tear off his special sperm-coated arm and throw it to a female. It’s already common knowledge that the octopus has four pairs of arms, but these guys have a few other multiples as well. The octopus also has three hearts and nine brains. Two of the three hearts function by moving blood through the gills while the other keeps an octopus’ circulation running smoothly. The fact that this eight-legged wonder has nine brains has something to do with why its considered the smartest creature of its genus; however, not all of their brains are formed in the traditional sense. While the octopus has a relatively large command center located in its cranial region, each of its eight legs are also wired with highly complex, independently functioning consciousness. This consciousness allows an octopus to scavenge for food with one set of tentacles while performing separate tasks with the others. The octopus is the supreme multitasking artist. Romeo and Juliet don’t have anything on the octopus; when it comes to love, they’re as extreme as it gets. Not only does the male die shortly after mating with a female, having babies for a female octopus is occupational suicide. After laying up to 400,000 eggs, a mother octopus will remain at her post, forgoing nourishment in exchange for ensuring the safety of her unborn babies. When the eggs finally hatch, the female’s body immediately begins to deteriorate from the inside out and her organs begin to fail one at a time until she’s extinguished all together. Pretty intense. While most octopuses are harmless to humans, there’s one in particular that spells trouble. 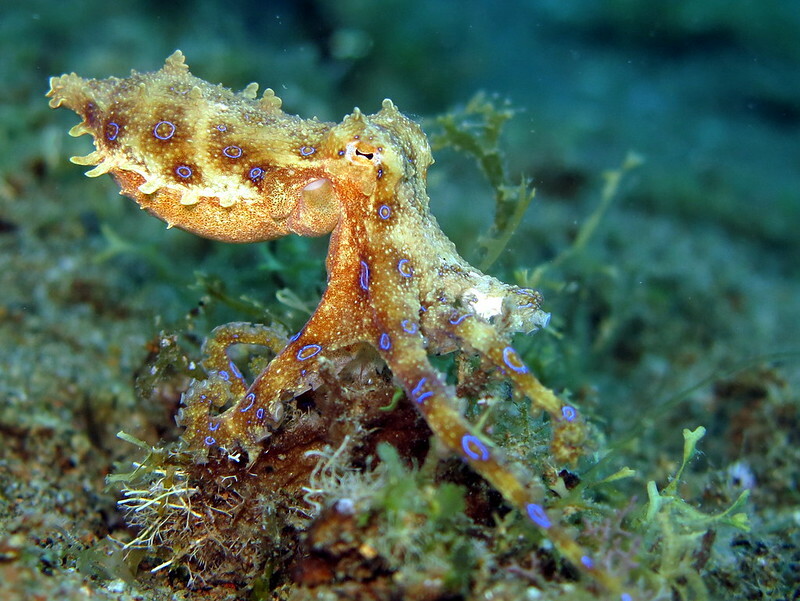 The striking blue-ringed octopus is easily identifiable by its brilliant blue and black rings and yellow skin, and are found mainly in tidepools and coral reefs in the Pacific and Indian Oceans, including Japan and Australia. Although the blue-ringed octopus is only about 5 to 8 inches long, it carries enough venom to kill 26, full-grown adults within minutes. Their bites are nearly painless, and victims rarely realize they’ve been stung until respiratory paralysis begins to set in. What’s worse, doctors and researchers have yet to create an antivenom for the bite, making the blue-ringed octopus one of the deadliest creatures in the ocean. Other species of octopus have been known to eat their own young and sometimes attack, suffocate and slowly eat an overly handsy mate.